This is definitely not your standard pizza. This recipe calls for roasted butternut squash, fontina cheese and bacon – a wonderfully, savory combination. Preheat the oven to 425 degrees F. Toss the butternut squash, onions and garlic with oil and 1/2 tsp kosher salt. Bake in a shallow dish or on a baking sheet for 20-40 minutes, stirring every 10 minutes, until onions and squash begin to caramelize. Coarsely mash with a fork and add 1/4 cup chicken broth. Turn oven to 475 degrees F. Roll out the pizza dough on a floured surface. Sprinkle 1 tbsp coarse cornmeal on a non-stick baking sheet or a pizza stone. Carefully place rolled out dough on top of the baking sheet or pizza stone. Bake in oven for 3-5 minutes. Remove partially cooked pizza crust from oven and evenly spread butternut squash mixture. 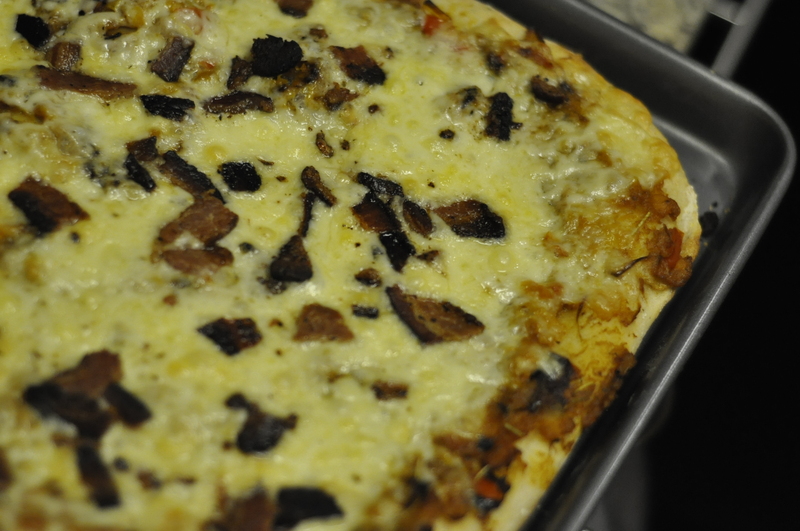 Top with shredded cheese and bacon. Bake for 5-10 minutes, until cheese is melted and crust is golden brown. This was delicious pizza. I would make it again! That sounds really good. I haven’t thought of using squash in lieu of sauce but maybe I will on our next pizza night.